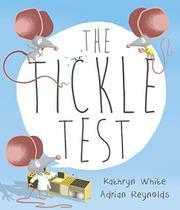 A mouse wants to join the Tickle Squad but first must prove that its skills are up to snuff. As two lab-coated rodents carefully look on (this is serious, scientific observation, after all), one tiny mouse tickles all kinds of creatures hoping to trigger a guffaw. Tickling a giraffe is easy; just run up and down those long legs. Tickling a bear requires a bit more caution, but it’s fun when they start to wriggle and giggle. Tickling an octopus, however, can be quite tricky, as the tickler-in-training wonders: “An octopus loves to be tickled for sure, / but which was the arm that I tickled before?” Written in jumpy verse with rhymes that sometimes carry over into the speech-bubble comments of the scientists, the rhythm itself is ticklish and fun. Comically large, round ears make the tiny mice easy to spot, and various bodily functions triggered by the tickling are sure to elicit giggles. Alas, some of the animals’ laughing expressions can be difficult to interpret: scrunched eyes and wide mouths with sharp teeth don’t always look very jolly.